I like the engineering definition of tolerance; it being the range of how far a true measurement can differ from what’s intended or, put simply, how much variation can occur for a system to continue to operate effectively. 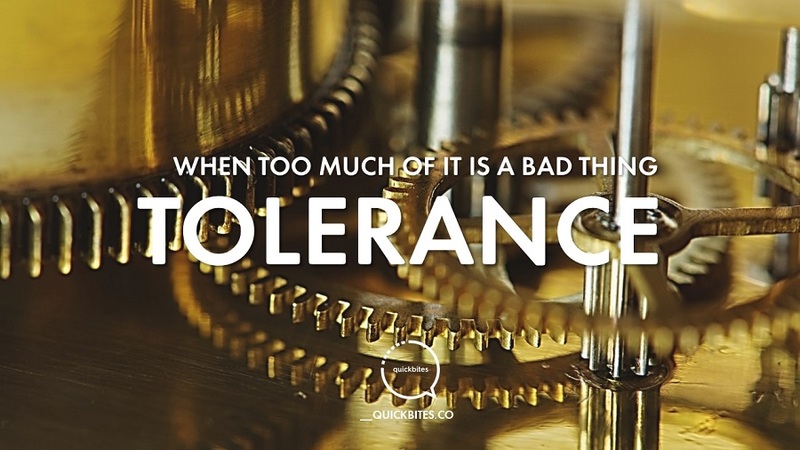 The idea of specified tolerance, the notion that tolerance has limits, is a useful benchmark for our personal and professional lives. It implies that our acceptance of unfavourable situations or behaviours, our ability to ‘put up with something’, can or should have an expiry date. It suggests that there will be a boundary to our endurance or our stoicism. Understanding this limit, knowing when to call it a day on situations or behaviour by saying enough is enough, is where we can become unstuck. Despite engineering showing us the way, too often we ignore the boundary that tolerance has set for us and condone or shapeshift into something we’re not. We think that tolerating a situation is strength, that we are the more noble person or organisation by being forgiving and accepting. In fact, we don’t get stronger, we get weaker. Science will tell us that if the tolerance limit is exceeded, the system will cease to operate as effectively and may collapse altogether. Too much leniency at a personal level will result in disempowerment and an inability to realise potential. Too much slack in a business will result in a loss of its competitive edge. However, when we stop tolerating, one of two things can happen. The situation improves; through honest conversation, constructive adaptation and compromise from all parties, or the situation dissolves and we move on. Either way, by owning the fact that our tolerance limit has been reached, we breathe deep and allow improvement and growth to flourish. Prolonged discomfort means something. If you’ve tried compromise and adaptation, without any concessions or change in return, it is a sure signal that you may be reaching a tolerance limit. If something feels ‘not quite right’ then it probably isn’t. You’re entitled to have needs. You have them as do organisations, which require certain standards and results to be achieved in order to compete and remain sustainable. Know when to assert these standards and requirements by using assertive language; state your needs and enforce consequences when they’re not met. Creeping normalcy refers to the experience of adjusting to small incremental change which over time becomes detrimental. We tolerate in the moment what appears to be a minor change or unfavourable situation, but as these small tolerances accumulate they ‘stack up’ to destabilise and threaten our individual and collective wellbeing. Take a stock take of where you are now and where you used to be, or check in and recall what you said you’d never tolerate. The bigger the gap the more of a problem you have. Business and Leadership expert Robin Elliott is extensively qualified in people and operational management and has held C-Suite and Asia Pacific roles for a number of multinational and publicly listed companies. She is currently the Founder and Managing Director of QuickBites - Digestible Business Learning and provides consulting, coaching and product solutions for professional development. Robin is an Associate for the Macquarie Graduate School of Management in Sydney and regularly delivers keynote presentations in their MBA and Executive Education programs.